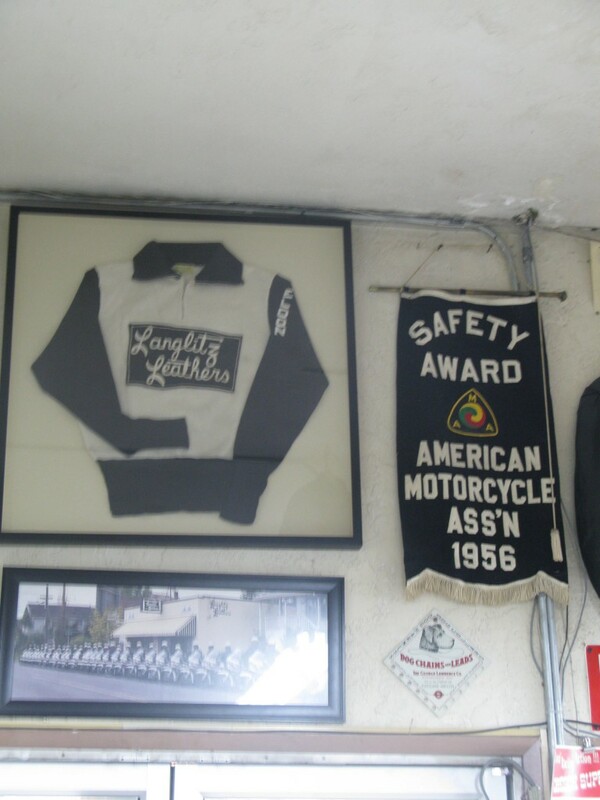 during our last visit to Portland we also visited the famous manufacturer of motorcycle jackets Langlitz Leathers. John Weber was kind enough to give us tour of the shop and production. 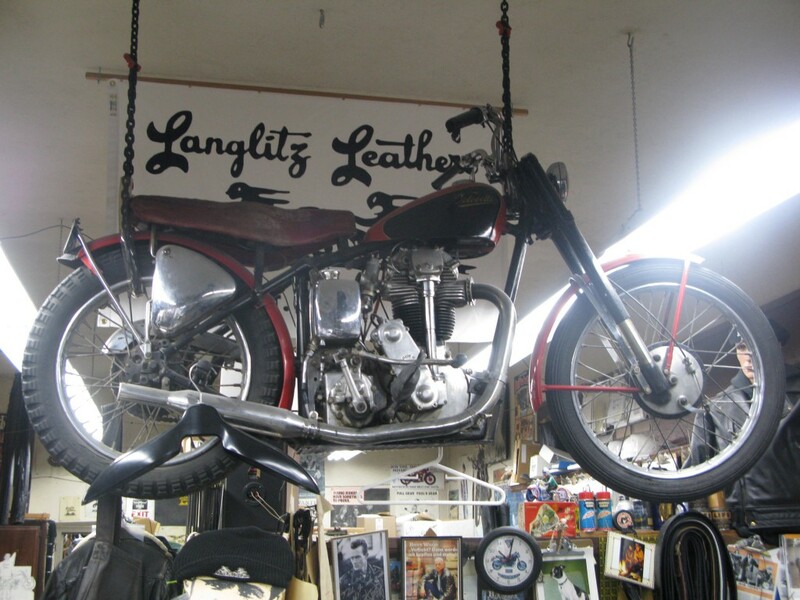 Langlitz was founded 1947 by Ross Langlitz and has been producing high quality motorcycle jackets ever since. You can order your own custom jacket there. All production is done in the own workshop on 4 cutting tables and 8 sewing machines. 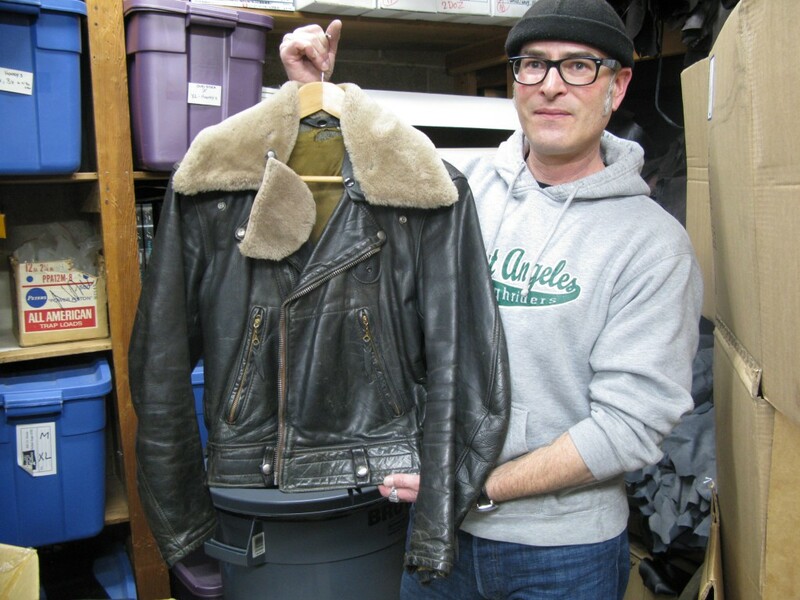 They offer an alteration service (“if you purchased something from us and outgrow it”) and even offer to buy back your jacket or sell it on consignment for you. founder Ross Langlitz in front of the store, 1952. Ross Langlitz on his Velocette. the Velocette today hanging from the ceiling in the store. John Weber with an original jacket, an early version of the Columbia. Ross Langlitz wearing an early Columbia. 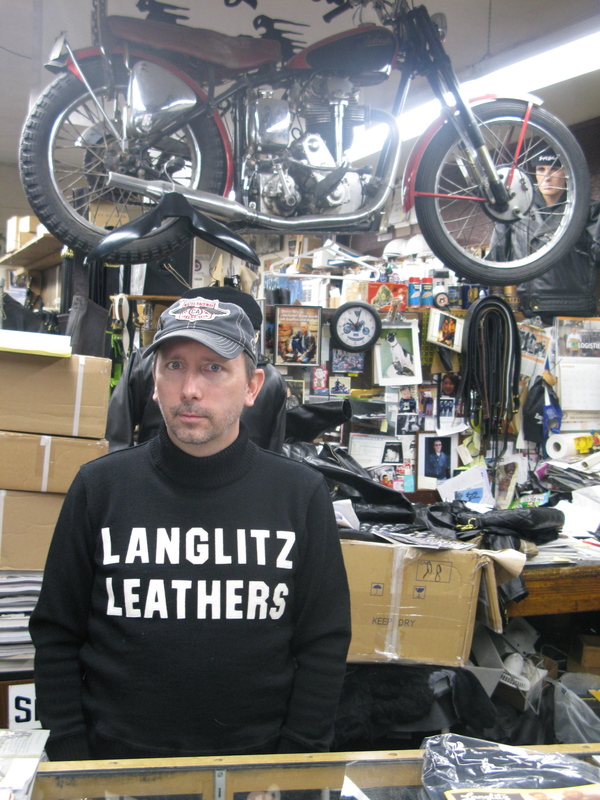 Ross Langlitz wearing a motorcycle sweater made by DEHEN. There has been a longtime cooperation between Langlitz and Dehen. a turtleneck sweater specially made for Langlitz leathers. another version of a motorcyle sweater most likely again made by Dehen. Portland motorcycle police officers in front of the Langlitz Leather store. Ross as model on a vintage ad from the early 1950’s. b/w photos and vintage ads provided by http://showandgo.blogspot.de. Thanks, Paul. This entry was posted in Uncategorized and tagged Dehen, Dehen1920, John Weber, Langlitz Leathers, Or., Portland, Ross Langlitz by AMTRAQ. Bookmark the permalink.